Marvel Studios has released a brand new lengthy trailer for Captain Marvel starring Brie Larson in the title role. The new trailer’s jam-packed with action, yet it also manages to squeeze in some new details on this highly anticipated comic book adaptation. The second full trailer provides new details on Carol Danvers’ backstory and new clues as to what Captain Marvel knows about her origin. The latest trailer debuted during the 2019 Super Bowl featuring the Los Angeles Rams and the New England Patriots. 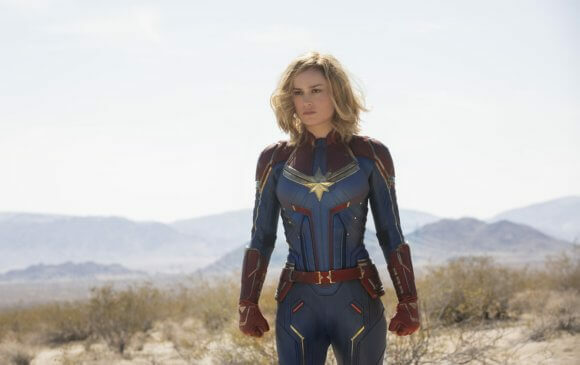 In addition to Brie Larson, the Captain Marvel cast features Samuel L Jackson as Nick Fury, Ben Mendelsohn as Talos, Djimon Hounsou as Korath, Guardians of the Galaxy‘s Lee Pace as Ronan, and Lashana Lynch as Maria Rambeau. The cast also includes Gemma Chan as Minn-Erva, Rune Temte as Bron-Char, Algenis Perez Soto, Mckenna Grace as the young Carol Danvers, Annette Bening, Jude Law as Starforce, and Clark Gregg as Agent Phil Coulson. The filmmaking team of Anna Boden and Ryan Fleck (It’s Kind of a Funny Story, Mississippi Grind) directed and wrote the screenplay with Geneva Robertson-Dworet and Jac Schaeffer. The story’s by Boden, Fleck, Robertson-Dworet, Nicole Perlman, and Meg LeFauve. Marvel’s Kevin Feige produced and Louis D’Esposito, Victoria Alonso, Jonathan Schwartz, Patricia Whitcher and Stan Lee executive produced. The behind the scenes team includes cinematographer Ben Davis, editors Debbie Berman and Elliot Graham, production designer Andy Nicholson, and costume designer Sanja Milkovic Hays. Marvel Studios will release Captain Marvel in theaters on March 8, 2019.